The action consensus is a binding framework of this Ende Gelände action. Many initiatives, individuals and working groups have been working on this text in a collective process in open plenary sessions for several months, and finally agreed on it consensually. Therefore it is very important to us. The action consensus is a premise for making the Ende Gelände action transparent and well-assessable for all participants; it conveys that, even in such a big action, we take care of each other and support each other. As Ende Gelände, „we say what we do and we do what we say”. We invite all people who join this consensus to take part in the Ende Gelände action. From the 25th to the 29th of October 2018 we will, together with many people, oppose the programmed distruction of the Hambach Forest and severely disrupt the smooth operations of the Rhineland coal mining area with mass acts of civil disobedience. In doing so, we will take a stand against the continued extraction and combustion of coal, one of the crucial drivers of disastrous global average temperature rises. Given the urgency of the climate problem, we consider it necessary and appropriate to go one step further: from public protest to civil disobedience. Because the politicians keep on betting on the destructive fossil fuel energies. The Hambacher Forest is now becoming the vivid symbol of resistance against this for more and more people. Our action will take the form of a publicly announced mass blockade which people can take part in in different ways – following the model of the successful Ende Gelände blockades from 2015 to 2017. It doesn’t matter if you are a seasoned protester or not, everybody should be able to participate. We will block technical infrastructure such as railways, access roads and diggers to cut power stations off from the coal supplies. We will take a visible stand against the clearing of the Hambach Forest. We will take straw mattresses with us so that we can be comfortable while we blockade. We appreciate it if activists use facilities (e.g. lock-ons or hammocks) to extend the blockades. We will behave calmly and carefully and will not trigger any escalation or put anyone in danger. We will use our bodies to block and occupy. We will not damage or destroy any infrastructure in doing so. We will not be stopped by constructional barriers. We will move through or around police or company barriers and not be provoked. Our action will paint a picture of diversity, creativity and openness. Our action is not directed against RWE workers, RWE contractors or the police. The safety of the activists taking part, of the RWE workers and of all the participants is our highest priority. We prepare well for a save route to our places of actions. We are preparing carefully and reliably for our actions. We come from different social movements and political spectra. Together we are taking responsibility for the success of the action. We want to create an atmosphere of transparency for all participants in which we look out for and support each other. We will prepare ourselves for the blockade together by conducting action trainings in advance. 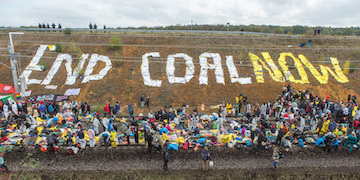 We will show solidarity with everyone who is resisting the climate violence of coal power and is standing up to the social and ecological consequences of fossil energy production. We firmly oppose any attempts to use opposition to coal extraction for reactionary or nationalist aims.